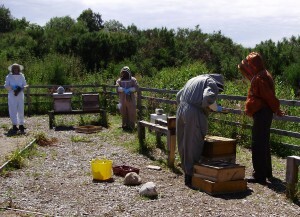 Saturday July 2 proved to be a wonderfully sunny and calm day – just right for our Beekeeping exam. We were thrilled to have Ian Craig, a most senior Scottish beekeeper, to come and be our examiner and the first examinee started at 9 a.m.
As our out-apiary is now well equipped with hives and bees it proved to be an excellent place to hold the exam with more than enough hives to provide Ian and the candidates with a satisfactory opportunity to ‘display’ their abilities. As is becoming the custom in the Moray Beekeepers Association the day was marked with good humour and lots of laughter all of which helped those being examined to ‘keep calm and carry on’. Tony and Viv spent a good deal of the day there both assisting in the progress of the examination and innumerable cups of tea, chocolate buns and shortbread. It is wonderful to be able to say that not only did all the seven candidates satisfy the examiner but all passed with a Distinction which is a mark of more than 75%. It is quite unnecessary to say that we were all thrilled and much congratulating was to be seen and heard!! It goes without saying that the Committee is thrilled and most gratified to know that the hard work that has been put in by all during the last winter and spring period has paid off ‘in buckets’. Our other wonderful news is that the Portacabin, which was sourced by John Baillie, has arrived and is already proving to be a huge asset. The day finished at 4.15 p.m. and many tired but happy folk set off to their respective homes with broad smiles on their faces. The Committee of Moray Beekeepers would like to offer their sincere appreciation and thanks to Ian Craig for travelling almost the entire length of Scotland to conduct the examinations so very professionally. 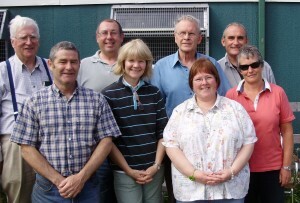 Candidates: Gerry Thompson, Wendy Jamieson, Donna Clark, Andrew Watson, John Baillie, Pamela Nairn, Graham Hill. Is Tony picking his nose in that picture?!! Love the 3 monkeys photo! It was reassuring to find that I knew more than I thought I did during the exams, and I would definitely recommend the basic beemaster course to all new beekeepers. Sooner or later you are bound to experience the scenarios you’re likely to be tested on and some advance knowledge of what’s happening in your hive could save you making silly and/or disastrous mistakes. Sorry didn’t explain that very well. The open mesh floor is usaluly below the entrance, the bees fly out above it. The queen excluder can be put above the entrance but immediately under the brood box. The workers can then get out but the queen hopefully can’t, although there is some chance that a queen slimmed down to swarm might be able to. Well done to one and all! !